Since the 9-11 attacks, Defense Secretary Donald Rumsfeld has been – in public at least – a breezy optimist about using U.S. military might to defeat America's enemies. But a newly disclosed Pentagon memo shows Rumsfeld has private doubts about Iraq, Afghanistan and the global war on terrorism. Rumsfeld says the U.S.-led coalitions would win in Afghanistan and Iraq, but not without "a long, hard slog." He writes that the United States "has made reasonable progress in capturing or killing the top 55 Iraqis" but has made "somewhat slower progress" tracking down top Taliban leaders who sheltered al Qaeda in Afghanistan. The memo, written last week, is vintage Rumsfeld, challenging his aides to think again about whether they're doing the right thing. But, reports CBS News Correspondent David Martin, it is also a bleak assessment of what the U.S. has accomplished in the two years since 9-11. "We are having mixed results with al Qaeda," he writes. "Although we have put considerable pressure on them, a great many remain at large." The commander of U.S. forces in Iraq, Lt. Gen. Ricardo Sanchez, confirmed an increase in the number of attacks on American troops. Sanchez said the average of 20 to 25 attacks daily had increased over the last three weeks "to a peak of 35 attacks a day." He did not elaborate. Ambush bombers struck again in the tense Sunni Muslim area west of Baghdad, in the northern city of Mosul and in the heart of the capital. The Baghdad bombing slightly injured two U.S. soldiers, while witnesses in Fallujah said four Americans were carried away on stretchers after a roadside bomb exploded there. , U.S. troops of the 4th Infantry Division arrested more than a dozen suspects, including a former major general, in pre-dawn raids Wednesday north of Baghdad. The Bush administration is hoping foreign governments will offer both money and moral support to reconstructing Iraq at a donors conference in Madrid that kicks off Thursday. Turkish officials have indicated in recent days that the proposed deployment of perhaps 10,000 troops could unravel if Iraqis continue to oppose it. But Defense Secretary Donald H. Rumsfeld says he remains hopeful that Turkey will find a way to follow through on its offer to help. The probe into the August bombing of the U.N. headquarters in Baghdad confirms statements made by U.S. officials that the U.N. staff here refused American military protection, reports CBS News Reporter Lisa Barron. As House and Senate negotiators worked on a compromise version of the $87 billion war funding bill, the White House vowed to veto the measure if any of the reconstruction aid is in the form of loans. The Rumsfeld memo, dated Oct. 16 and first reported by USA Today on Wednesday, offered a much starker assessment of the global war on terrorism than contained in Rumsfeld's public statements. "It is pretty clear that the coalition can win in Afghanistan and Iraq in one way or another, but it will be a long, hard slog," he wrote. White House press secretary Scott McClellan, traveling with President Bush in Australia, declined to comment on the memo. Mr. Bush, however, talked about the war on terrorism with reporters aboard Air Force One en route to Canberra, where he planned to discuss this with Prime Minister John Howard. "I've always felt that there's a tendency of people to kind of seek a comfort zone and hope that the war on terror is over," Mr. Bush said. "And I view it as a responsibility of the United States to remind people of our mutual obligations to deal with the terrorists." On the battle against the terror network blamed for the 2001 attacks on the World Trade Center and Pentagon, Rumsfeld wrote: "We are having mixed results with al Qaeda, although we have put considerable pressure on them — nonetheless, a great many remain at large." They include the group's top leader, Osama bin Laden, and his right-hand man, Ayman al-Zawahiri. Rumsfeld wrote "we are just getting started" in battling Ansar al-Islam, an Iraq-based terrorist group linked to al Qaeda. Pentagon officials said the memo was another in a series of provocative questions that the secretary regularly raises with Pentagon brass. 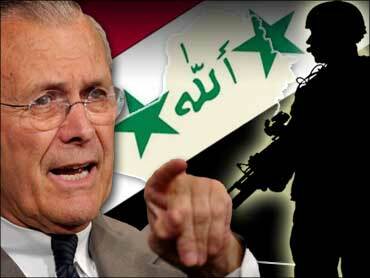 "Today, we lack metrics to know if we are winning or losing the global war on terror," Rumsfeld wrote. "Are we capturing, killing or deterring and dissuading more terrorists every day than the madrassas and the radical clerics are recruiting, training and deploying against us?" Madrassas are Islamic religious schools. Rumsfeld and other U.S. officials say some schools run by radical groups indoctrinate students to join in an anti-American holy war. Rumsfeld's memo raises the possibility of creating "a private foundation to entice radical madrassas to a more moderate course" and questions how to block the funding of the extremist schools. The memo also suggest that the Pentagon might not be able to change focus fast enough to win the war on terrorism. An alternative, Rumsfeld says, would be to create "a new institution, either within DoD or elsewhere — one that seamlessly focuses the capabilities of several departments and agencies on this key problem." The Pentagon and some Republican Congressmen are defending the memo, reports CBS News Correspondent Peter Maer. A Pentagon spokesman says the memo merely "raises questions that need to be asked." Texas Republican Jim Turner, a member of the House Armed Services Committee, says Rumsfeld used the memo to "raise some tough questions." Sanchez, the U.S. commander, acknowledged Wednesday that he was concerned over the rate of progress which the coalition was making in restoring order. "We are making progress, but we need to accelerate it, and accomplish it across all lines of operation — economic, political, security," Sanchez told reporters. "Once we get economic progress and law and order capacity built in the country, that will go a long ways toward re-establishing a safe and secure environment in Iraq. If we get unemployed back to working, that will contribute to eliminating some of the anti-coalition forces throughout the country. Those are really key things."